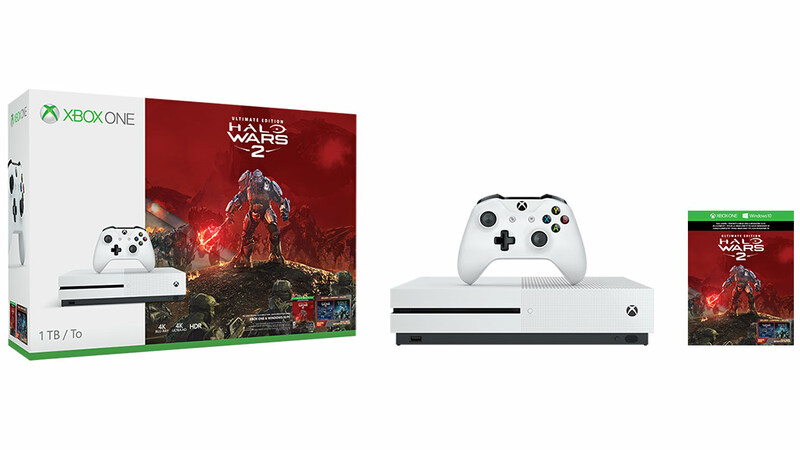 Xbox One S 1TB Halo Wars 2 Bundle has been announced. Xbox has officially announced today the new Xbox One S Halo Wars 2 Bundle (1TB). With Halo Wars 2's release date being February 21st, Microsoft has launched this new bundle including the game to satisfy the Halo fanbase. Complete with the Halo Wars 2: Ultimate Edition, an Xbox Wireless controller, Halo Wars 2: Season Pass, Halo Wars 2: Definitive Edition, and the Xbox One S 1TB console itself, this bundle will be at the starting price of $349 MSRP and is now available for pre-order here. Usually in console bundles we see some form of art or design on the console itself to represent the game it is being dualed with however, in this case they chose to stay with the slick white Xbox One S.
The bundle is set to release on February 17th which would be just in time for the game's launch on the 21st.